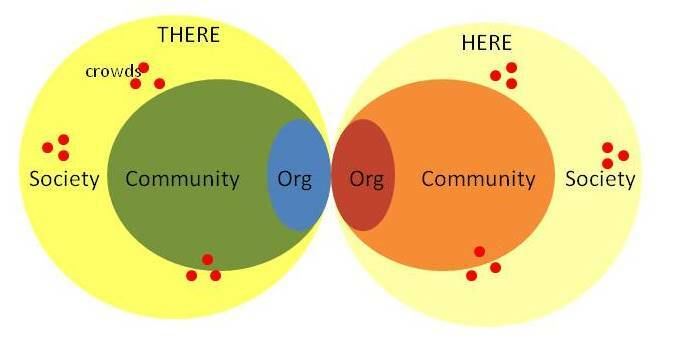 This post represents the second of two exploring crowdsourcing and crowdfunding. The first one can be found here. Heather Gold, a comedian and speaker, caught my attention soon into my reading on crowd-related innovations. Gold gives us the term tummler, a term that comes from Jewish tradition and means a “noisemaker hired to entertain and make sure everyone had a good time.” Adapting this term to new media, Gold argues for a new way of engaging in critical conversations guided by a tummler, someone who helps make sense out of the vast amount of information now available. The tummler moves the conversation forward, providing multiple points of entry and acknowledging diverse expertise based on experience and point of view. This term resonated with me because it opens the conversation about the need to build new roles and systems for managing communities that respond to the needs and interests of crowd participants. It is already extremely difficult to manage the exchange of financial and evaluation information between small grassroots project and its U.S. or European-based partner in the best circumstances. Adding web-based crowdfunding projects onto a fragile bi-cultural infrastructure could damage the trust between partners. If ever there was a need for an organizational tummler, it is now. I began to imagine how we could use crowd concepts within the two international development projects I know well. While I have read that crowdsourcing techniques have been used to monitor elections in Afghanistan and are being explored as ways to monitor aid effectiveness in Africa, neither of those applications relate to social change work with which I have been involved. The people I work with don’t have smart phones or even internet connectivity. Nevertheless, I remain curious to explore further how modified crowdsourcing could be used to take a quick pulse of community needs or receive rapid updates following up on services in places where poor people have limited technology. Crowdfunding, on the other hand, directly relates to what organizations already do: write grants. I already need to create budgets, describe outcomes, and shop around proposals. Why not do the same thing on crowdfunding sites, resulting in a whole lot of people funding that Lorena stove or water cistern? Values, communication, and capacity. The most effective NGOs already tackle these issues regularly with robust conversations at all levels. Before inviting totally unrelated people into your community, make sure that you are clear on the values that guide your work, you have an effective communication plan in place, and you have capacity on both sides of the partnership to fulfill obligations with honesty and transparency. Values serve as signposts guiding the way through difficult discussions, like whether crowdfunders should vote on projects or get gifts in exchange for their funding. Projects + general operating=healthy org. Every social change organization needs money to pay for the projects that deliver key services. They also need general operating support to work their magic around the edges of these projects. Social change results from the transactional and transformational needs of communities being met, and transformational needs are rarely funded through project grants. I have come to believe that significant social change happens on the margins of funded projects as staff members exercise their informal power within their communities and unscripted relationships flourish. Traditionally, individual donor funds tend to be used for general operating costs. As organizations grow their individual project-based funding, they need to grow general operating funding to support critical capacity building. Ownership. The issue that first gave me pause with crowdfunding is the issue of ownership. When people give money towards the production of an indie movie, they collectively own that movie. They get a copy of the movie on DVD. Crowdfunding applied across cultures requires a more nuanced and transparent position on ownership based on organizational values. I think about the many organizations that use child sponsorship or animal underwriting as fundraisers; we must ask ourselves critical questions about human dignity, power, and individual vs. collective and local vs. foreign ownership. Last year a crowdfunding organization told me that I could get $500 or so in donations in exchange for itemized food receipts from an impoverished community who buys all of their food in a public market. This would have undermined the value of local investment and control, and $500 staff time would have been expended hunting down scraps of paper. Organizations can chase crowdfunding much like they chase any funding; many non-profits sadly experience mission-creep because the money can be found just beyond the scope of their existing work. With effective tummlers in place, however, these same organizations can make the most of self organization, diversity of knowledge, and indirect collaboration while keeping a clear sense of values and capacity to deliver. They can take advantage of innovative opportunities to convert crowd members into “smart swarm” community members with the collective energy of a hive of honeybees and the unified focus of sparrows in flight.